With panoramic views, eye-catching artworks and a high-tech gym, the new Aloft Perth is aiming to attract locals and travellers alike. I’m greeted by some fluorescent artwork, a foosball table and some chairs that look like they’ve dropped from space. “This is, um, unusual,” I offer to Aloft’s general manager and publicist before I’m promptly corrected. “We like to say ‘different’,” I’m told. Whichever way you spin it, those behind Aloft Perth have a point. The futuristic tower shining like a glowstick on Great Eastern Highway was already a talking point before the hotel’s opening yesterday and that’s before anyone had even had a drink in the rooftop ballroom (yes, seriously). Different it is. Especially, dare I say it, for the end of town not traditionally considered a hipster’s paradise. But does that matter when you’re in prime real estate near Perth Airport, the new Perth Stadium and the racecourse? Apparently so. It’s not so much travellers as locals the hotel is targeting — part of the international chain’s “community engagement” mantra. Queensland-raised manager Stephen Morahan has worked 25 years in hotels, most recently in Thailand and Phuket. Here in Perth, he lives in the nearby Springs Rivervale precinct, among the people he’s itching to get through the hotel’s front door. Fun fact: he’s also an ironman triathlete. “There’s very little (around here) and not much that any of us are quite willing to walk to at this point in time so having this sort of a venue will really change things for the residents here and really take ownership of the property and make it theirs,” Mr Morahan says. Behind that fluoro-lit exterior, it’s more playground than hotel lobby. There’s a ping-pong table, an internet cafe, a bar, a reading area and statement bubble chair, which you can already tell is going to be the backdrop to everyone’s holiday selfies. Perth art consultant Lisa Reeves has sourced local artists for the statement room art, bright bar mural and quirky entry statements. Nothing is an accident, she insists, whether it’s the pale greens and blues (a nod to the Swan River), natural timbers or the talking-point furniture you’ll be posting on Instagram. “We’ve tried to bring a sense of personality and fun to the hotel,” she says. If the locals don’t go for the quirkiness, they’ll be going for the facilities — a gym which will be open to non-guests and has those fancy treadmills where you can pretend you’re running a track anywhere in the world and function rooms which resemble an up-market student quarters, rather than the place you go to agonise over pie charts. As with all Marriott International’s Aloft hotels, it would help to learn the lingo before you visit. There’s no such thing as a “swimming pool” here, they call it “splash”. The pool deck? That’s the “backyard”, and “refuel” is where you go for your lunch. You get the idea — “different”. Different, albeit with a lot of competition. The $70 million hotel is the seventh to open in Perth in the past year, including Crown Towers down the road. I ask Mr Morahan why Perth staycationers would choose here, rather than the competition. And with that I’m shown the view from the rooms. Great Eastern Highway might have the traffic and industrial surroundings but go a few feet into the air and it’s a very different story. There are views of the Hills on one side, the city on another and the Swan River like many of us won’t have seen before. And Mr Morahan has a trump card. “I don’t think (guests) will be expecting that and that is a great selling point. You are capturing and enjoying an experience in Perth you can’t get anywhere else with those views,” he says. Another fun fact: there are no floors 13 or 14 and the rooms are numbered anticlockwise in keeping with feng shui. But back to those views. Waking up to a view of the Hills, while only being a few minutes from the airport during a stopover or something longer, would be quite something. But it’s the rooftop where the hotel really gets a chance to show off. An open kitchen and ballroom, which opens on to a terrace with 270-degree views across the city, is breathtaking. So breathtaking you can imagine the hotel will have wedding planners fighting their way past all the Christmas partygoers who were apparently already scrambling for bookings weeks before yesterday’s opening. “The rooftop is our showpiece. Having a ballroom on the top of the roof, I personally don’t know anywhere else that has that in the country,” Mr Morahan says. They weren’t wrong when they said it was different. Aloft Perth has 224 loft-style rooms with walk-in rainfall showers and free internet access. Opening room rates start from $168/night. 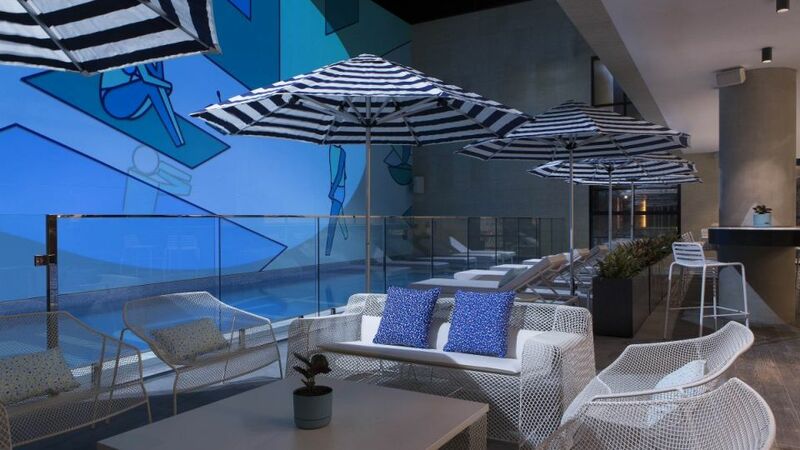 aloftperth.com.